NATIVE NEW ORLEANIAN and this issue’s cover artist Jax Frey is like a wildflower in a summer field, blowing in the wave of a gentle wind, seemingly free from the conformities of a defined world. Frey has lived many lives and fearlessly follows her dreams. Before becoming an artist, she lived in upstate New York, on a West Virginia farm, in El Paso and Denver and even attended medical school in the Dominican Republic. Eventually, she settled in California and went to a culinary academy, opened a catering business, studied business, marketing and life coaching and worked in sales at a software firm. But she always knew that one day she would be an artist, even though she has no artistic training. She says, “As a child, I didn’t know I could draw. But I always felt like an artist, and it was just a matter of time. I moved around a lot but my heart was always here. And that was the start of it all for me, missing New Orleans. 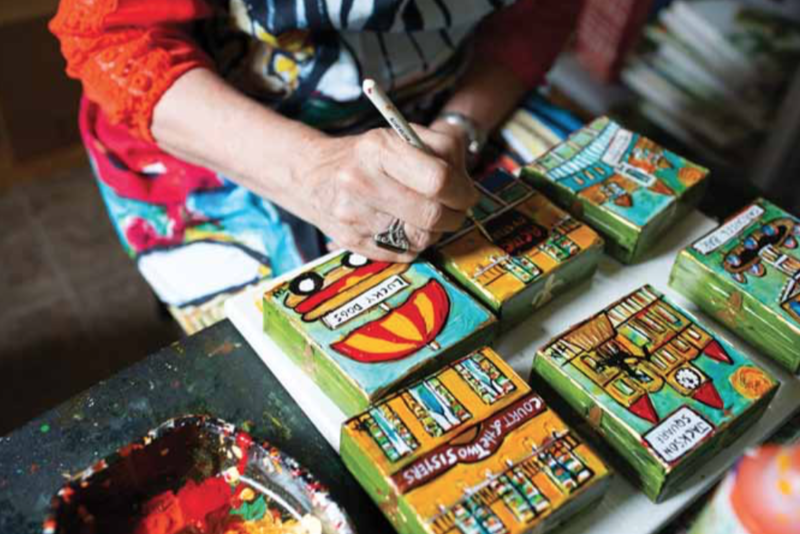 I began to paint little things that I missed and remembered about the city, and it turned out that people really liked them, the mini paintings.” So, after living in California for many years, she moved home and has lived in Covington since 2006. Frey is perhaps most well-known for her Little Views mini paintings, which are colorful, highly textured, mixed-media paintings on four-by-four-inch paintings of mostly New Orleans and Louisiana icons, landmarks and images such as Café du Monde, Commander’s Palace, Jackson Square and French Quarter scenes. On June 26, 2017, she painted and recorded her 20,000th Little Views mini painting and received world’s record status for the Most Original Acrylic Paintings on Canvas by One Artist from the World’s Record Academy, the world’s largest organization that verifies and recognizes new records based on unlimited categories. Since setting the record in 2017, she has now painted a total of 23,000 works of art, according to Frey. In addition to her works on canvas, Frey offers a product line of over 25 items based on her paintings. Her products include (but are not limited to): aprons, jewelry, coasters, giclées, napkin sets, ornaments, photo frames, scarves, tote bags, and cheese plates. For more information about Frey’s product line or to special order her mini paintings, go to artbyjax.com. Her work is exhibited at Ariodante Contemporary Crafts, 535 Julia Street.